GENEVA – Torture in Iraq may be worse now than it was under Saddam Hussein with militias, terrorist groups and government forces disregarding rules on the humane treatment of prisoners, the U.N. anti-torture chief said Thursday. Manfred Nowak, the U.N. special investigator on torture, made the remarks as he was presenting a report on detainee conditions at the U.S. prison in Guantanamo Bay as well as to brief the U.N. Human Rights Council, the global body’s top rights watchdog, on torture worldwide. “You have terrorist groups, you have the military, you have police, you have these militias. There are so many people who are actually abducted, seriously tortured and finally killed,” Nowak told reporters at the U.N.’s European headquarters. WASHINGTON – President Bush said Friday he was “taken aback” by a purported U.S. threat to bomb Pakistan back to the Stone Age if it did not cooperate in the fight against terrorism after the Sept. 11 attacks. At a joint White House news conference, Musharraf said a peace treaty between his government and tribes along the Pakistan-Afghanistan border is not meant to support the Taliban. He said news reports had mischaracterized the deals. “The deal is not at all with the Taliban. This deal is against the Taliban. 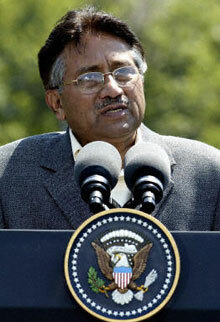 This deal is with the tribal elders,” Musharraf said.